Standing tall above the table, Tower of Madness is one part press your luck dice-roller, one part subtle dexterity game, and a good bit of goofy fun - just so long as you’re not looking for anything even moderately deep. In Tower of Madness, players take on that timeless Lovecraftian labor – the beating back of eternal darkness and the protection of the world against the implacable advance of nightmarish elder evils from beyond the stars! 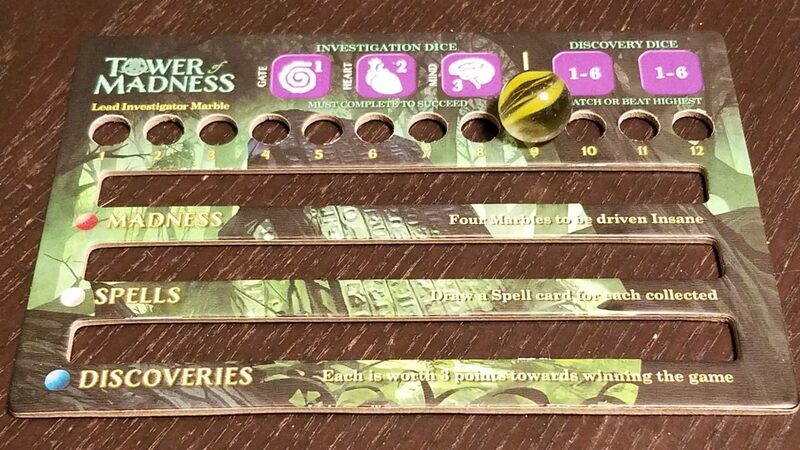 But it’s more than just our lives on the line – as the sanity of our fellow investigators wanes, it may be that some of them turn against us, and look to bring about the very doom we seek to avoid! Jess: Oh man, I hope none of us lose our marbles! Gameosity received a copy of Tower of Madness for review. We were not otherwise compensated. The first and most striking thing about Tower of Madness is its presentation. Smirk & Dagger has done a great job of giving us an impressive object to gather around when playing. 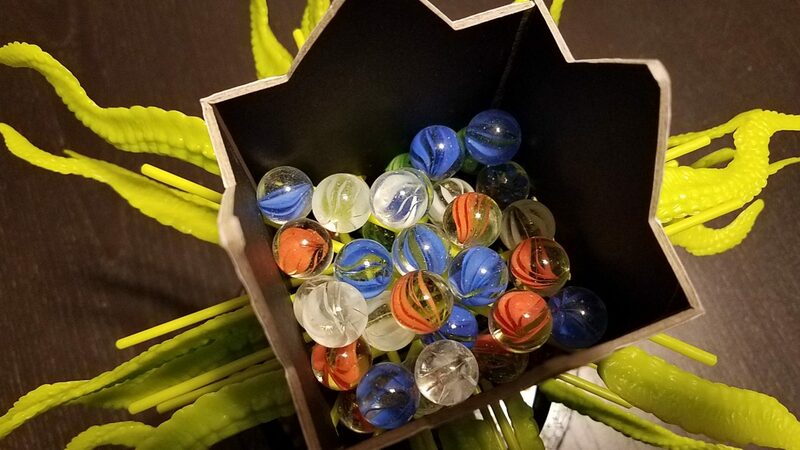 But the titular tower does more than just intimidate the unprepared – it contains the marbles that form one chaotic aspect of Tower of Madness’s gameplay. 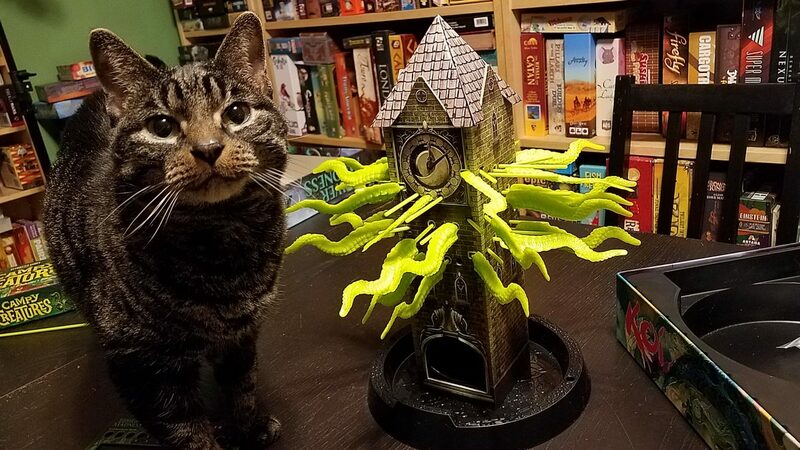 Tabby for scale, not included in the base game. Andrew: Oh, and the tentacles. The tentacles are also important. 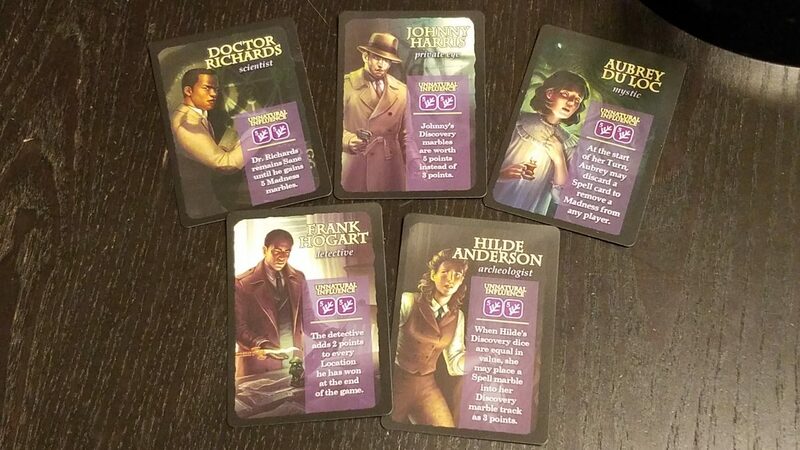 In Tower of Madness, each round, players will take turns investigating a horrific location, trying to be the one who manages to make the most successful search and therefor claiming the discovery points associated with it. 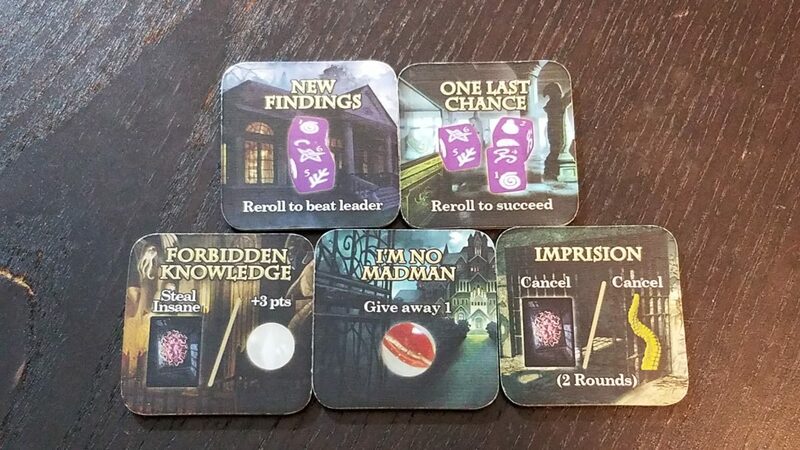 Interestingly, players compete in this regard every round – the first player who successfully investigates a location sets the bar for the rest of the players which needs to be beaten in order for subsequent players to claim the location card. In this way, the difficulty of investigating a location isn’t static from game to game, but changes depending on how well players are doing. If the players can manage to make it through the pile of location cards before the world ends, then the one who has the most discovery points wins! More or less the worst chopsticks. 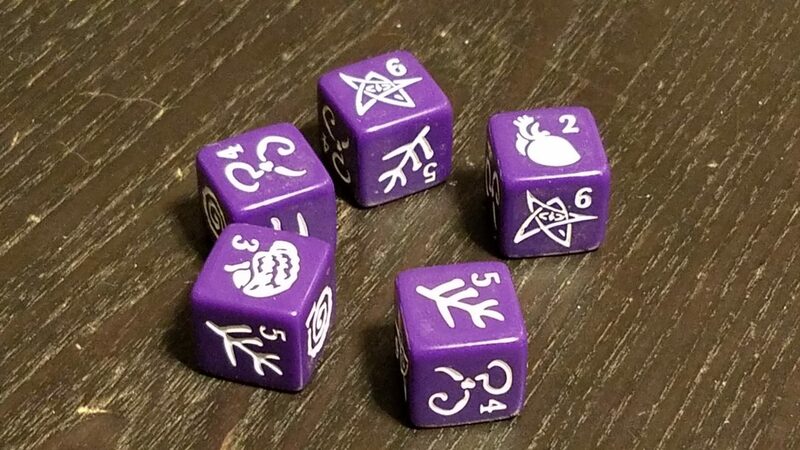 But all that is done via a series of dice rolls, with players looking to gather specific sets of symbols while being forced to lock at least one die per roll. 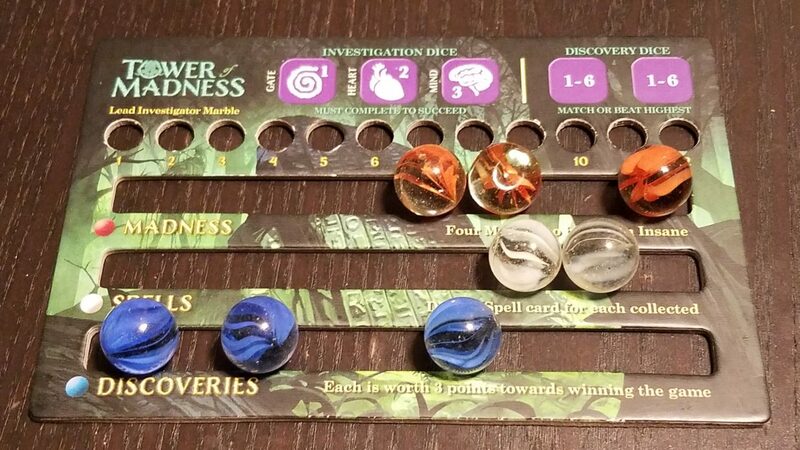 The excellent player boards guide one through the simple turn structure – three symbols must be locked before a player’s turn ends in order for them to succeed at investigating, and the leftover numbers indicate how successful their search was, to be compared to their fellow players. 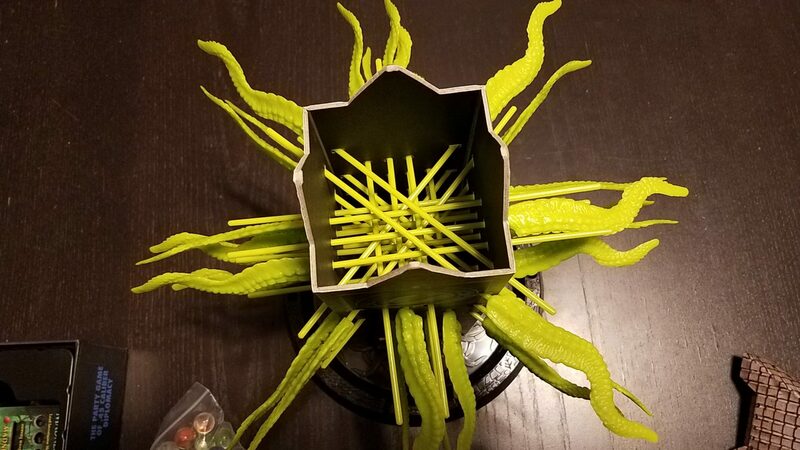 However, should a player push their luck on the dice too far and fail to lock the requisite 3 symbols (or if they roll a failure condition specified on a location card), then they must gently yank one of the 30 Horror Tentacles, which are the only things holding the marbles aloft within the tower! 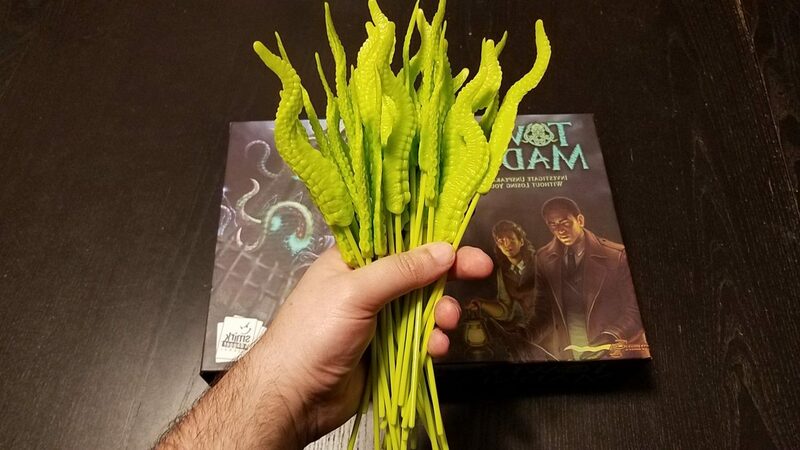 Jess: Horror Tentacles? Redundant much? This player is doing great…except they’re one marble away from madness. Insanity is a funny thing – when a player is insane, they’re hardly out of the game. Instead, they will use the ‘Insane’ side of spell cards and, critically, no longer give a hoot about saving the world – instead, an insane player wins if they manage to trigger Doom via the third green marble! Jess: So, the dice are random, the pulls are random, the marbles are random, and there’s a random chance that the game will end all at once and everyone loses, unless the player who drops that particular marble is randomly insane? Andrew: Well, when you put it that way, it all sounds a little crazy, yeah. 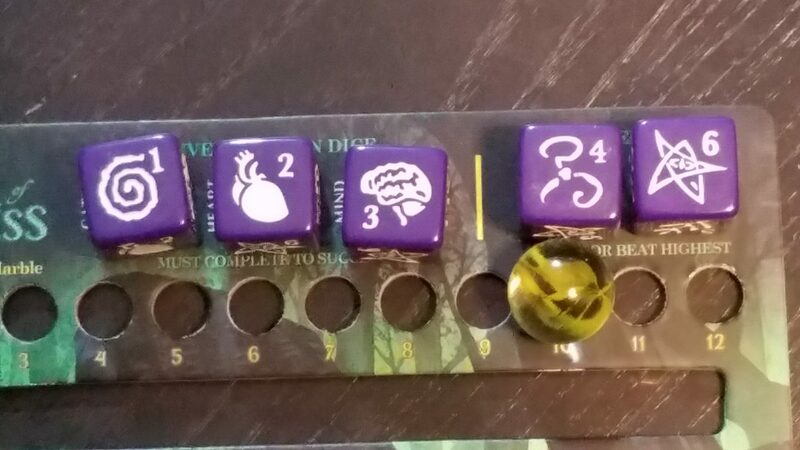 This player managed to lock the requisite dice as well as register a 10 on their investigation. it’ll be tough to beat. 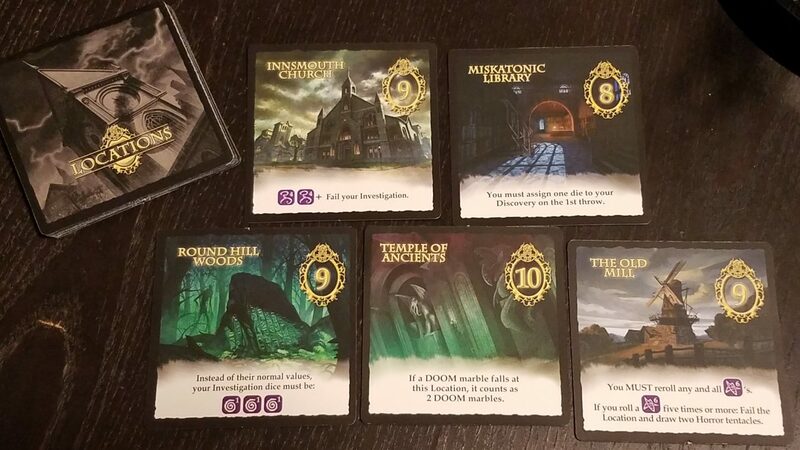 The thing about Tower of Madness is understanding what it is and what it isn’t. To be blunt, Tower of Madness is shallow. Any dice-driven game is going to have an uphill struggle with the ‘strategy and tactics’ crowd – simply put, dice are chaotic, and can only be planned around/mitigated so much. But dice/press your luck randomness does not itself make for a shallow game. However, the other part of Tower of Madness’s gameplay, the iconic tentacle pull, is also purely random – you can yank tentacles like crazy without effect, or you can drop a pile of marbles on a single pull – and since there are multiple types of marbles with different effects, that creates another point of total randomness – including an end-game condition no one can control. All these unknowns boil down to a simple fact – it’s hard to approach Tower of Madness as anything other than a super-casual diversion, which, we feel, is exactly what it is intended to be. Though the theming is dark and arguably a little mature, the fact is that Tower of Madness would probably be a fantastic game for younger or more casual players. That said, even the chaos-loving casuals of Team Gameosity found Tower of Madness to be bit lacking in choice and player agency. 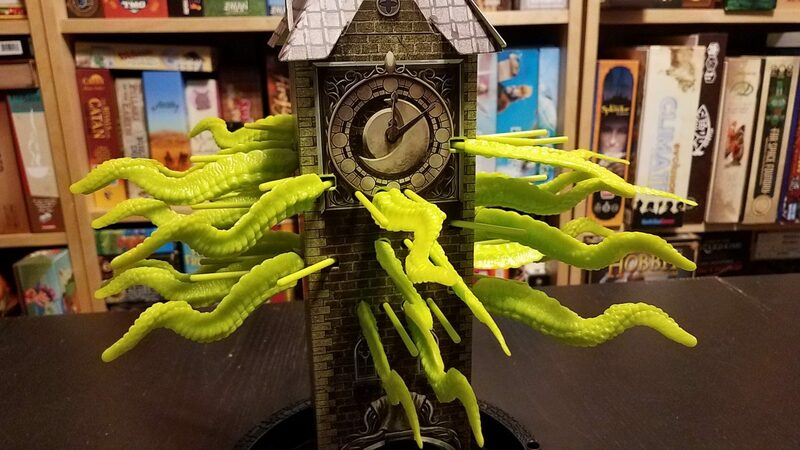 We found Tower of Madness to be caught in an odd place between a more ‘gamerly’ game, with spells and shifting victory conditions, and a much more casual game, like, well, Kerplunk (the comparison is unavoidable, and nothing for anyone to be ashamed of). Andrew: I can’t say I disliked Tower of Madness. But there was nothing to really grab me and pull me in. Jess: I have to agree. This one wasn’t for me either. But I’ll tell you what, I’m 100% sure that this will be a hit with younger gamers who are less fussy about player agency and more interested in pulling tentacles and watching marbles drop. Andrew: Totally. But the theme precludes it, I’m sure, from being printed under the Smirk & Laughter imprint, which is all about family friendly games like the excellent Nut So Fast. All in all, though the tower itself stood huge, Tower of Madness fell a little flat for us. We didn’t really connect with much in the core of its gameplay, and though the production was excellent, ultimately this one wasn’t for us. While we weren’t exactly crazy for Tower of Madness, the core of its experience still makes for a fun game, and can be found in some other titles. Finally, we weren’t kidding about Nut So Fast – that sucker’s a great little party game, and the folks at Smirk & Dagger did a great job with it.